Most of the time on multiple-track main lines, trains run in one direction on one track and the opposite direction on the other track. But sometimes, it is necessary for a train on one main line track to move to another main line track. For example, for a Westbound train running on our Westbound main line (the track closer to you) to get to the freight yard, it needs to get across the Eastbound main line. 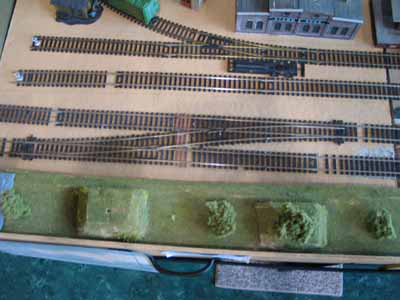 This is accomplished by using a crossover, a pair of track switches that divert the train from one main line track to the other. Of course, to avoid collisions, train movements are coordinated by the railroad�s dispatcher, ensuring that trains approaching this point are stopped by red signals or by orders re-routing them or otherwise limiting their movement. 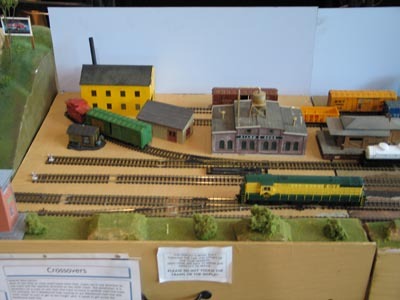 After a brief run on the "wrong main" the westbound train can enter the yard through another switch, and normal main line operations can continue. 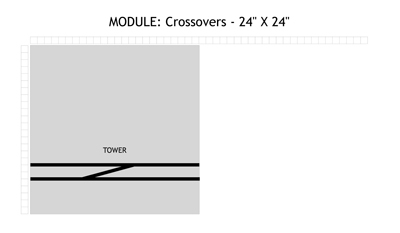 Crossovers allow trains to move between parallel tracks. An overhead view of the crossover.